Photos and text by Gabrielle. As I mentioned last week, Oscar’s birthday was on Saturday, and I thought it would be fun to give a little report. But more than the report, I have birthday parties on my mind and wanted to discuss them with you. I’m kind of worn out of them. Anyone else? I think it’s time for me to figure out a new strategy. I’ve mentioned this before, so it may be familiar to you, but early in our growing-a-family stage, when I could see we were going to have a lot of kids, we put a sort-of “birthday party plan” in place. Certain birthday traditions would be consistent every year (breakfast in bed, putting up decorations, birthday cake with candles), family parties would be the default, and friend parties would be spaced out and would only happen at certain ages. I need to go review my notes, but I think we decided on ages 3, 5, 8, 12 and 16 for friend parties. That worked pretty well for a long time. But in the last few years, we’ve had to switch things up. There are two main reasons. First, we’ve had some big moves. And depending on when the move happened, a friend party might not make sense. For example, we moved to Oakland a few weeks before Ralph turned 16. I always assumed we’d throw a big party when Ralph turned 16, but here we were, just moved to Oakland in the middle of the summer, and none of our kids had any local friends yet! So we made alternative plans. You may remember, we set up visits for film-loving Ralph at Lucas Studios and Pixar Studios. He felt celebrated, but a friend party just wasn’t in the works. The second reason is that over the years, even though we’ve spread them out, I’ve started to lose patience with big friend parties. I’m not sure what it is. And I’m actually a bit conflicted about it. For many years, I really loved putting together a birthday party. The birthday kid would pick a theme, and I’d get to think of cute details and creative activites. It was always a fun thing to work on with my kids. You could see their imaginations going and see their eyes light up as they pictured the party. We never did big budget affairs, but it was fun and creative. And there was something like a high after throwing a good party. But then something changed in my head, and it’s like I’m just craving a tiny gathering of friends, the simplest decor, old school games — like button, button who’s got the button — and a traditional cake. And for the finale, maybe we make hats out of newspaper (except we don’t even subscribe to a newspaper!). It’s like I’m picturing a Depression Era birthday party or something. I’m not sure what’s going on. And this simpler vision? It’s not really real. Because I still love the planning part. I still love brainstorming with the kids on how to apply the theme to food or party games. My kids have amazing ideas! I still love the creativity of the whole thing. I get really excited for them during the planning stages, and then I get progressively stressed out as we start to execute the plans. Picture me talking like an old codger, muttering about wasting time and money. Probably it’s me turning into an old, grouchy person. I’m not sure. 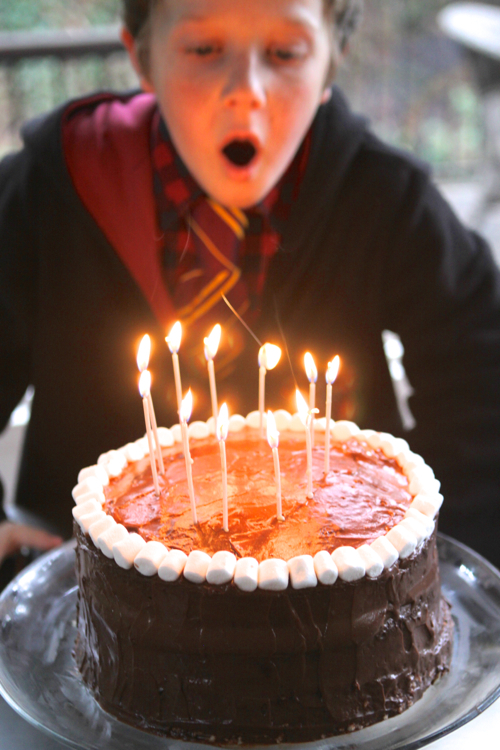 Is there anyone else yearning for really simple birthday parties? Is it a stage of life thing? Have I just maxed out my parenting creativity? My parenting energy? Or perhaps I’m just worn out this month in particular — January equals holiday stress followed by Alt Summit. Will I feel differently in March when our next birthdays come? Is it the age of the guests? Would I feel more excited planning a party for teenagers? What’s your take? How do you handle birthday parties? Do you love them? Host them every year? Space them out? Avoid them altogether? I’d love to hear! And, I really do have a little report on Oscar’s party. If you’re curious, feel free to keep reading. Oscar was turning 11, which is not on our usual friend party schedule, but he hadn’t had a friend party in ages, so we all thought it was high time that we invite his friends over. We really like Oscar’s friends — a good mix of kids from school and cub scouts and church. So over the Christmas break, we started planning. We made a long list of awesome ideas, which included making a giant Golden Snitch piñata — filled with gold-covered chocolate galleons and those Lindt truffles that look like golden snitches. The list also included things like an elaborate Sorting Hat ceremony, sewing wizard robes for everybody, and a full Harry Potter themed menu. It was super fun to make the plans. But as I mentioned above, when we started actually taking action on the plan, I rebelled. I was resistant to spending a ton of energy on this party, when really, Oscar just wanted to hang out with his friends. Guests arrive. Lunch is pizza and a veggie tray. We used this recipe for the Butter Beer, and Maude led out on this activity. I’ve never been to Harry Potter World and don’t know what official Butter Beer tastes like, but this version was delicious! While we made and drank the butter beer, Ben Blair asked the kids Harry Potter trivia questions. 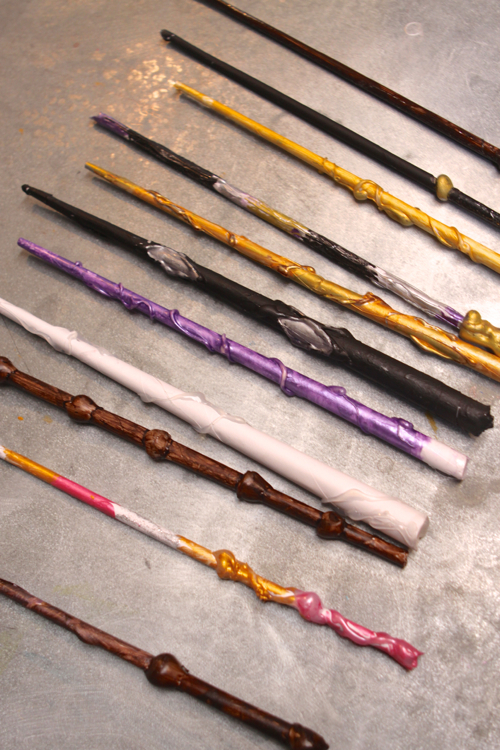 Wand making is an awesome activity but it can take some time. Waiting for hot glue to cool. Waiting for paint to dry. So the kids went back and forth between the family room and the studio (which are side by side). In the studio they would work on their wands, and in the family room, we had the first Harry Potter movie showing on the TV, and the kids could hang out, or play chess. Then they might go work on their wands again. Sidenote, these wands are amazing! We’ve been making them for years and they are one of my favorite crafts to make with kids, because they are cheap, easy, and they look so cool! They’re essentially just hot glue and a piece of regular 8.5 x 11 paper. We keep those materials on hand so it feels like a totally free activity when we make them. As the wands finished up, Ben Blair led the kids in a game of Mafia, but with Harry Potter names. So instead of Mafia, Police, & Citizens, it was Death Eaters, Order of the Phoenix, & Muggles. After Mafia, we went back downstairs for birthday cake. Oscar likes to request unusual cakes. This time he wanted a chocolate cake with a thick layer of rice crispie treats at the bottom, and he wanted the whole thing frosted with chocolate pudding. Olive made the cake and it turned out wonderfully! I only have 2 kids and like some of your kids, they have the same bday week. I am a kindergarten teacher and I can’t handle kids feeling left out! I have seen the sadness in kids’ eyes when they hear about a party and are not invited. My kids are 11 and 13 and have only had 2 parties each. Some years they have wanted a party but with only a couple kids and I know someone is going to hear about it, so I will suggest they include that child. If they don’t want to include that child I will suggest we just have a family celebration and they are fine with that. Social media makes it worse bc kids post pictures at parties and then even more kids feel left out! Bc their birthdays are the same week, sometimes we will take them both on an outing, like to a Boston Red Sox game! Last year when my son turned 11, we had a sleepover campout in the backyard including movies projected on a big screen. They loved it! For my 5 year old, he took his friends to a baseball game at the local university. The games are free if the kids wear their baseball jerseys – I packed Cracker Jacks and pizza and we had a picnic there. Later they played wiffle ball in the outfield – it was a lot of fun for kids and parents. I totally get this. I feel like there’s the pressure to make pinterest or blog-worthy pictures out of the event as well. It’s crazy, in my opinion. My boys (now 6 and 9) didn’t have a party until they were 5. Before that, we’d have grandma and aunts/uncles over for cake and presents. I’ve stuck with at-home parties, and we’ve limited the guest list. In general, it’s been close to the age they are turning. I do love picking a theme and getting the kids engaged in the activities, but I refuse to spend a lot of money on decorations that will only be thrown away. (I make an exception for pinatas.) Homemade decor is the best. And we’ve kept the games very simple – scavenger hunts, pin the tall on the –, and the like. It’s great. This year, my 9-year-old couldn’t decide on who to invite, so he said he’d rather just have a couple of his best friends over to watch a movie. So that’s what he did! We ate pizza, had ice cream sundaes, and they played and watched a movie. He was more than happy with this celebration. As they continue to get older, I will look to them to determine what they want to do to celebrate the day. i have 4 kids- always have a party always very simple never spend much $. Beach parties are great- have kids bring a boogie board and towel and then provide watermelon, cupcakes and pretzels and few simple games in the sand- always a crowd pleaser! Or backyard parties – extremely simple- no bounce houses or princess here, just old fashioned “depression era” games like pass the present, musical chairs, painting rocks! (huge hit every time) planting a flower in a flower pot and painting the flower pot- one simple craft few simple games, homemade cake and thats it! Luckily I live somewhere where we can almost always be outside- this is key- outside for crafts games food and running around. I realize many can’t do that depending on local and season but if possible my advice is move as much as possible outside. More room to breath! Once they are a bit older and ready fro something new, I think of what that kid likes best- swimming, ice skating, theater and then we invite a handful of friends to join us doing that activity- the 13 year old invited 4 friends to go see a play and go out to dinner with her- perfect , simple, no decorations, no fuss just what she likes. My mantra is SIMPLE SIMPLE SIMPLE and its still exhausting. its just tiring being the mom and having to “produce” the party no matter how low key it is. I always say to my husband it was a successful bday if neither the bday child nor mama didn’t cry once! I’m not surprised that you were wiped out by Oscars party it sounds pretty elaborate to me, making a few different things and fancy cake etc I would have pared it down even more to make it easier on yourselves. Sounds like a great party – but also still sounds like lots of work to me! :) We either outsource (soft play, laser tag or similar) or just have the kids in the class (it helps that my kids are in small classes!) over for a simple lunch and cake and maybe a scavenger hunt or decorating cupcakes. Ideally the kids just run around in the yard most of the time though weather is not on our side for our winter baby. Always simple but the kids always have a great time. My kids are still really little. Their birthdays are just three days apart. In the past we’ve only done a family birthday party, but this year we are having a separate, small birthday party for the older kid’s friends. We’ll see how it goes. I find it all completely overwhelming. I never had friend parties when I was a kid, so this is all foreign territory for me. I hit that same point a few years into parties, and started giving my kids a choice: they could have a simple at-home friend party… OR, they could choose one friend (or occasionally two) to do something they normally wouldn’t get to do (like go drive race cars and play laser tag at a local fun center). One year, my daughter’s request was to go with two friends to McDonald’s PlayPlace. Easiest party ever! The kids had Happy Meals and played for an hour, then presents and ice cream cones and we were done! AND THEY ALL LOVED IT!!! Some years, we have simply planned a fun family activity. I’m always surprised by how content my children are with whatever we do if they’ve been given options! I am so pro simple, easy birthdays. My daughter turns 5 next month. We’re going to go to a play at the local children’s theater as a family and she gets to bring one friend. We’ll come home, eat cupcakes and that’s it! My other daughter’s birthday is in summer and for a couple of years, we brought cake and ice cream to a park and invited all her friends and their families. It was the best! We’d sing happy birthday, eat cake and the kids would play at the park. The adults could visit, and clean up was a breeze. My favorite way to do a party! When my oldest was younger we always did big parties but at home. We would come up with a theme (princess/luau/American Girl mystery) and we would have crafts and games related to the theme, a meal, a cake. This was pre-Pinterest, and evite- and I would do everything by hand. It was all lovely, and exhausting-but first child-my only girl-I love party planning ;) 3 boys later-and we’ve scaled way back. My oldest son is 15 and his birthday is November 1st. His birthday for the last 5 years has been: have a small group of boys over for pizza, go trick or treating, sleepover in the family room. My 11 year old did have a few parties at bouncy places, laser tag. But now he also will have a small group of guys over-watch a movie, pizza & cake, sleepover. And I’m really anti sleepover, we never do them except for their birthdays-so it’s a huge deal. My 7 year old has just had birthday parties at home with lots of kids. There’s no “theme”. It’s in September, it’s always hot, and they run around with water guns, jump on our trampoline, my awesome scientist husband does some “Mad Science” experiments, my older kids help out-simple foods, Costco cake-done. Thank you for sharing, G! I can totally relate to much of what you are saying. For many years, I was all about the party details. Homemade invitations, decorations galore, amazing feast, games! It seemed like each time, I would get a little more carried away and a little more stressed out come party day. Then a year and a half ago, my third child passed away unexpectedly. I see each birthday as such a gift, a blessing, now. When it comes to parties, I do what I like to do. I really enjoy decorating, so I do it up when it comes to that! But I keep the food simple and take it easy on the rest because that’s just more me. A relaxed, happy, thankful mum makes for the best parties anyway. I’m so sorry to hear about the loss of your child. Thanks for sharing your story and how it’s changed you. Your comment about being “more me” really resonates. I sound like you but I’m not even 30 yet :) I have two kids and my plan is simple simple simple. I always think WWMD? What Would Mom Do? My mother would have cake and pizza, and we’d go outside to play for hours. Perfect! We have always done family parties with our kids aunts and uncles and cousins but now that our daughter is turning 6 this year we will just do a friend party and thats it. I’m glad you are so open to doing things differently. My husbands parents and siblings comes from a mindset that you never sway from “The Way Things Are”. All party celebrations must.be.done.a.certain.way. Why? “Because that’s how we always do it, and how our parents did it, and that just the way things are done”. Its exhausting. More exhausting than the actual party. My son’s birthday is the week before Christmas- a TERRIBLE time for a birthday party. Plus, I really dislike birthday parties. But of course, his friends all have them, so he hopes for one! 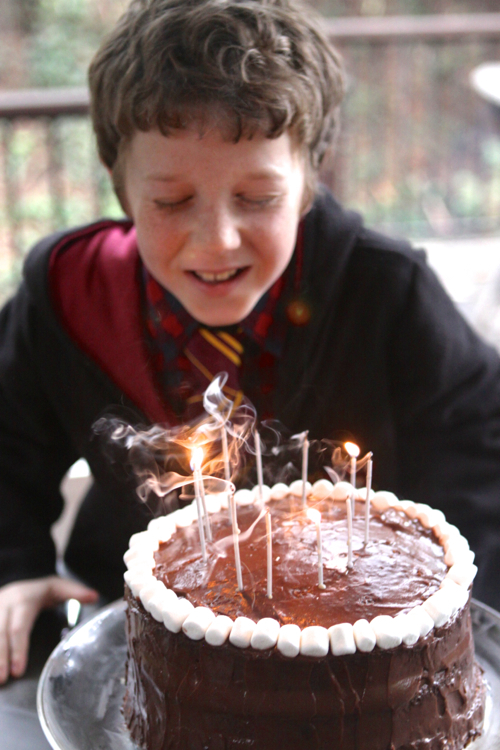 This year, he turned five and it seemed like a big deal so we wanted to do something special. My husband and I actually bought a small bounce house from Amazon (cheaper than renting one!) and set it up in the garage. His 3 best neighbor buddies came over after dinner on his birthday, a Tuesday, to bounce for half an hour and then eat a slice of cake. It was the perfect party! That’s what my sister does. She only ends up having parties for her youngest but I think he’s leaning the other way this year. I’ve offered that to my oldest but now she wants a party or wants to take a couple of close friends out. This past April, my son turned 7 and here in Canada April can be snowing, warm, blizzard, rain or anywhere in between. But we had a coolish spring day, we did a scavenger hunt in the backyard (we hid little things around prior and each got a checklist what they had to find – a marble, a stone, a piece of garbage, a dinosaur, a ball, etc) and they got to keep any of the items they found if they wanted (like the bouncy balls and the tiny dinosaurs). We popped popcorn with butter and put it into popcorn boxes from the dollar store with a tag that he handwrote “thanks for coming” and they played in the backyard. Games, simple, a ribbon strung up with some balloons and a simple cake. Done. I don’t like the parties at the party place, with the loot bags full of cheap chinese plastic and stuff that you aren’t allowed to get rid of but who needs it…? So yes, I am Totally there with you on this post! great idea! I am always trying to figure out how to evade an actual goody bag! I have 5 kids and like you, the friend parties are a special thing we don’t do every year. And when I do them, I am pretty intentional about directing my effort/time/money to things that kids actually care about. That boils down to food and a fun activity. I have never known a kid to come home from a birthday party and tell me how it was decorated. NEVER! I have had some hits and misses, but 3 parties stand out as the most successful. 1 was order pizza, make origami ninja stars, then throw them at targets. 2 was order pizza, dump all our legos out on the floor and let the kids make cars to race down a ramp (cardboard box). 3 was meeting at the park for cookies, string cheese, and juice boxes. I am telling you, the simpler the better! On the other hand, I love to make “fancy” birthday cakes- 3d shapes and characters. They take a good chunk of time, and I do them up to the 10th birthday. We all have our thing, ya know. I just don’t like when traditions or habits hold us hostage. If it’s not working anymore, you can change! Ahhh! Your last sentence caught me. LOVE IT. Thank you. When I was a kid, my mother, an anxious introvert, was stressed out by the prospect of hosting any kind of birthday party whatsoever. I was always made to feel guilty that she was spending an inordinate amount of time and effort on me, when really she wasn’t, she just didn’t like doing anything related to hosting parties. Needless to say, I resented having to feel guilty for having a birthday, and now I feel like whatever you do, it should be with positive energy for the event and the person feeling celebrated. If you are starting to feel cranky and stressed out–just don’t do whatever is making you feel that way. Keep it positive, even if that means you end up “doing” less. I stopped making birthday cakes for my husband because I just didn’t have the time any more to do it and stay in a good mood. Now I buy a small cake and everyone is happier. Now, if you are an anxious introvert type, you are going to have to put on your big girl pants for a while and do what it takes to make somebody else feel celebrated on their birthday. I wish my mom had been able to do that. Also, the birthday industrial complex has somehow convinced us all that a party has to have a number of coordinated, storebought details. We need to dial it waaaaaay back on that one. Kids especially like fun, imaginative games and surprises. You don’t need to spend anything to give them that. I like this. “Whatever you do, it should be with positive energy” and “Stay in a good mood.” A child remembers their parents’ attitude and feelings MORE than any other thing at a party/occasion. Wow, Gabrielle, I feel like you read my thoughts and wrote them down. Thank you for clarifying it for me, lol!! My son is 14. and my daughter just turned 13. Every year until they were twelve, I excitedly planned and produced themed parties, always affordably and with as much creativity as we could, and they loved them, but I think I just got burned out. The same feeling crept into holiday celebrations in the last couple years, too. No-one was clamoring to carve pumpkins or color Easter eggs, etc., and it felt like the magic had kind of gone out of lots of different celebrations. It’s funny how you say Depression-era parties because that’s exactly what I’ve been yearning for, too. I think it comes from reading Reminisce magazine and seeing how happy people were with truly simple celebrations. I think your burnout stems from the fact that you know how much work is going to go into to get it done. Even if the kids are doing the work, you still have to supply things, and maybe help or manage the mess. Before we had kids we used to host these awesome dinner parties, and we haven’t had a single dinner post-kids like we did before they were born. When I think of the work, I get a headache and then I don’t even get around to scheduling anything. We recently had a small, think 25 people, Christmas hors d’ouvres party and I served a lot of pre-made bought from the store food and still getting/keeping the house clean and getting everything hot and set out was a huge time commitment. And my husband was barking at my heels the whole time about the cleaning effort (which we desperately need to do anyway, now we just had a push!) and the cost (which was less than $100). I offer my kids a choice between a day in the city with me, missing school, or a party. I’m happy to say they pick the city. It only took me my first 3 to figure this out so my last 2 benefit. I also get one on one time I love. And a party from 12-3? That is a long time to entertain. Those wands look so fun–gotta try them! Have you ever done a friend birthday party that had no decorations or theme or games whatsoever? Radical, I know. My kids have been to a few of these lately and they have the best time. I’m totally inspired. For my kid’s upcoming birthdays I want to invite the whole class/neighborhood, and just feed the whole lot of them and let them run wild for two hours. We’ve done a few “mock sleepovers” with about 6 kids total. Pizza, a few games (Twister, Apples to Apples), sometimes an easy art project, then cupcakes (sometimes it’s decorate your own) & about 20 minutes of running around our small house like maniacs. Then they change into their PJs and we pop in a movie. One year we had the kids watch the movie upstairs and parents came 30 minutes early to have a cocktail while the kids finished the movie. We discovered in our small house, a drop-off party with not very many kids is the easiest option. I love socializing with parents but it does make it feel more overwhelming to manage the party and also carry on a conversation. Plus, this is super-inexpensive. My biggest hack for kid parties at home is Trader Joe’s pizza – the kids like it just as much as pizza from a pizza place, and it’s a fraction of the cost. For younger ages (under 6), we have done run-around parties with more kids, either at the park or in our local Y’s “kid gym” space. When my older son turned 9 this year, we had total 6 kids and took them miniature golfing at an indoor place in Alameda (it was November, unpredictable weather) and they also got about 30 minutes of arcade games. My husband and I borrowed a friend’s car so we could carpool everyone over ourselves (we only have one car). Easiest party ever and a big hit! Its funny, I call myself “the slacker mom” but I loved to throw birthday parties. 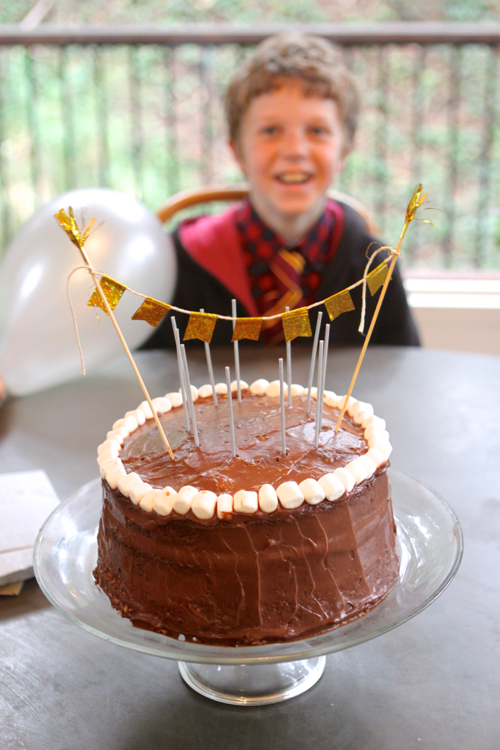 When my kids were young I made elaborate cakes–Thomas the Tank Engine, Hogwarts, Dragons, etc. We invited lots of kids (I have a horror of excluding anyone), played traditional games adapted to the theme, and did lots of running around. I loved it, though I felt like I had been mugged and left in an alley by the time they ended. Now the the older ones are too old. Like everything else with parenting–once it is over, it will never come back, so enjoy what you can. My youngest has disabilities and always wants to invite everyone she has ever met. So these days I am looking for venues where we can invite 30 kids of varying abilities with various special needs. It’s challenging and pricey, but it is also a group of kids who seldom get invited to parties so I don’t mind doing it once a year. Pinball and bowling have been big hits but we are always looking for something new. “mugged & left in an alley” describes it perfectly!!! And I love that you have those parties for your youngest. Incredibly special for everyone involved, parents included I’m sure! This is the year of small celebrations for our family. All 3 of our girls and all 5 of our siblings’ kids have summer bdays. It’s exhausting both physically and financially. Last year my 4 year old had her first friend party since 4 is when we start. We had the Fun Bus come to the house so that was their activity and I held it after lunch and just served snacks & cupcakes. Our 7 year old wanted a camping party. I went for it and it was great but bigger than anticipated. We had 3 tents in the backyard, 15 kids and about 10 adults with 4 spending the night. Craziness but my daughter will never forget it. Neither will I with the girls all up at 5 and in our pool by 5:30! I don’t do games because with a pool and summer bdays the kids are always happy just playing. Our oldest turned 16 and we live in the land of ridiculous sweet 16 parties which would never be in our budget. We had it in the backyard at night, put up string lights everywhere, wild flowers in mason jars, splurged on a DJ, had the pool open, a friend did face painting with blacklight face paint, pizza, snacks and a candy bar as a thank you. She & her friends loved it. They kept commenting that it was the best one they’d been too. I have to rest up for when the 7 year old turns 16! Long Island or somewhere else? My friend just posted on facebook about that. I’m so glad I don’t live anywhere near there. No, New Jersey near Princeton! It gets crazy! I totally relate to this right now! My youngest just turned 10 last week and I have been dragging my feet party planning. I think we made the mistake of saying yes to a party every year from the start for our two girls. I wish it had been established that it be every other year at the most. Especially having an early January party is hard. With being right after the holidays even my daughter has a hard time even knowing what she wants for her birthday! We have agreed to take a few friends to a trampoline park this year and pizza after. But, now the guest list is hard. She has a few key friends she wants there and then there are the few that I think she should invite not to hurt feelings. Oy. I totally know how you feel. I used to LOVE planning theme parties and the creativity of it. Now, I just hope they will ask for something simple…. What about having a friend party at their half birthday in the summer? Then on their actual birthday it could just be family? We’ve also done one big party for all three of our girls with friends and family in the middle of the year and then we’re done. Then on their actual birthday it’s birthday breakfast & a special dinner with just us. Oh my gosh…who’s got the button! I can’t believe that is a real game that other people know about! We make fun of (sorry!) my Mom all the time because she talks about playing Button Button with her Mom as a child…and how horribly bored they must have been! And she in turn always wants to play with her grandchildren, instead of seeing them on iPads! Hahaha! Our kids think its the funniest game! I always thought my Grandmother made it up….but I guess its a real thing! Thanks for the chuckle! We just hosted our first “friends” party for my daughter’s 5th birthday. We invited her entire kindergarten class (12 kids) which I thought would be manageable. What I hadn’t planned for was that almost every parent said they would be coming with their child. A few asked if their older siblings could come too. One entire family came (kid that was invited, older brother, and both parents)! I was blown away. My little baker’s dozen birthday party turned into this 30+ huge thing which was not what I wanted at all. I wasn’t able to do the fun little things I had planned with the kids because there wasn’t any room. I just didn’t understand. My daughter is the youngest in her class, so all these kids were already 5 some of them 6 already. They had never been to our house, but they knew us. We see them everyday at school. Were they afraid to leave their child alone with us, or were they just afraid to be away from their child? I’m hesitant to ever throw another “friends” party again. Maybe when she’s like 10 we’ll give it another go. I am so glad someone mentioned this because I have been very confused as to whether parents are supposed to stay or if I can just drop my daughter off and go. At most parties the parents seem to end up staying so I do, too. I guess I should just ask! I have only had family parties for my daughter, but this year I was thinking of having a friend party and my main concern was what to do with all of the parents! It’s like you have to host a kids birthday party and a cocktail party all in one – very stressful! That’s weird! Lonely people I think. I’ve seen evites where it seemed I, as a parent, was invited, but I pretty much always leave my child. ESPECIALLY, if I have already interacted with them. NOPE parties are for the invited CHILD!!! My daughter got an evite to a sleep over bday party and I didn’t even know the people. I just didn’t even respond. I’ve had that happen and I also was surprised and disappointed by the big crowd! Since then I always write – “drop off only please”. We know all the kids and parents in the class– about 24 kids. If the parents don’t feel comfortable they ask if they can stay (if kid is clingy etc) and then I at least can prepare for that. Kids behave better when parents not there in my experience. And I always have a sitter or friend at a party to give me a hand overseeing little ones when parties were under 6. Hovering parents almost always make things more awkward and tense in my experience! I have had a few parties. I’m okay with them. I don’t believe in spending a ton of $$. However, I live in fear nobody will come. I read an article recently about some ladies who had a party for every kid in a certain grade cause they knew the sadness of missing out. Then it turned out they got thanked for having the party cause some moms said their kids hadn’t invited to a single party at all. Maybe it was from your blog?? Anyway, I thought that was awesome! I am confused by parents who want to have a drop off your kid party, even though I do see how it is easier on the host to manage. Both my kids (age 4 and 6 ) have a few (less than 3) close friends whose parents I know well (share religious orientation, safety/risk considerations or values in common) and whose house I have been to (verified safe pool/lake/boat, pets, play area). I would not be comfortable dropping off my kid at anyone else’s house other than these close families that I know more about and with whom we share commonality. These are families who I talk to/text/email a few times a week so we are close friends with the parents — in addition to our children being friends. But there are other friends that my children have that they are super close to but who I realize do not share our parenting style or values, so I do not interact with the parents except for in passing. I do not forbid my child to have a close friendship with those children. I would not feel comfortable leaving them at those houses for a party and not for a play date either. And a bunch of 8 to 12 kids running around can be hard for two parents to manage or even if they have a nanny/sitter/relative help out on the day of the party for an extra adult or two. Until I moved out of my parents house – even as a teenager I was not allowed to go over to someone’s house unless my parents knew their parents and had spoken with them personally. I would not want to leave my child at a house where I was not close to and knew a significant amount about the parents. Perhaps my idea will change as my children get older and this kid drop off seems more popular. I would like to know how other parents handle drop off parties for kids: what ages, which parents, what locations (house only) or venue (play place, park, lake etc.). I would love to see a post on that topic :-) Thank you for such a wonderful blog. parents often stay in australia where I live. Some drop off, some stay. If your polite you ask the parent to help out and dont eat the food (if its minimal :). I was busy running my last party for my daughters class and about 5+ parents stayed but kept quiet off to the side. Most parents stay here for kids under 8. Now many of us are friendly parties is where we catch up :) I’ve stayed at most parties my kids were invited too. (for the younger ages) we also do lots of parties outside at parks/backyards or play centres/party places so easy for parents to stay. My sister and I have birthdays are two weeks apart (with my dad’s birthday smack in the middle! ), right around now after the holidays, so it was intentionally low key. Each person gets to pick whatever they want for dinner and dessert on their actual birth day (yes, even the time I requested only 7-layer dip as my dinner, and we all ate it :). My sister and I had joint birthday parties a few times, always at home, always with a homemade cake. On other years, we had a bigger family celebration– being surprised on my Dad’s birthday that we were all going to go to Disneyland as a family for spring break when I was young, a ski trip to Tahoe once we were in high school/college. And now there’s a new challenge, since my boyfriend’s birthday is the week before mine, and my sister’s boyfriend is the week after hers… our “birthday row” has now grown to a 5-week affair that includes 5 birthdays, Valentine’s Day and our anniversary (yikes). Talk about stressful. We aim to have a joint birthday dinner for sisters/boyfriends, and my boyfriend and I don’t do Christmas gifts, then take a trip for our anniversary/V-day. Thank goodness my mom’s birthday isn’t until May, the week before Mother’s Day, so we all have time to recover and then lavish her with love for weathering the annual birthday storm! I’m on the same page with the birthday parties as well. I’m so over the “invite the whole class” parties, which can be expensive and dominated by the loudest voices who may not even be close to the birthday boy/girl. I’m inspired by the more laid back, intimate parties that you describe. My 11 y/o son enjoys Harry Potter, so I may borrow a few ideas! The best party we had was at Adventure Playground in Berkeley. If you have not been yet, it is a fantastic way for kids to spend the afternoon building forts and being creative, and it is FREE. Even my daughter who is 14 had a blast. Hang out! That is the key word. That is all my boys want to do with their friends. The last 11th bday party I held was at home, with the friends he wanted over (no more including the whole class either for me), they watched a movie, played some nerf and video games in the basement, they had pizza and dessert, and then, guess what? They all went home! Yea!!!!! I don’t know why it took me so long to get myself together to do this. I would always do such a production or have it at some laser tag place or jumping place. They all just want to be in each others company and be goofs together. P.S. That is a very cute cake idea. Gabrielle, you are absolutely awesome and oh so cool. Love. LOVE! Reading your thoughts. birthday parties are and always have been my Kryptonite. I am so happy when they are over. I think it is because I never liked my own ones as a kid but always got myself build up in excitement – only to be disappointed. And now my daughter is very much the same. It doesn’t matter how hard I try, she can’t handle the excitement and has -at some point- a nervous breakdown. No fun. Right now I’m having two cakes in the oven for my two year old son (well, he turns two tomorrow) who is the king of making strange and that is why we won’t have any guests tomorrow. Yay. I just don’t like birthday parties. Still don’t like to celebrate mine. And I forget everybody else’s birthday. What you said about the depression aera sounded about right to me. I like simple. And i try so hard to make my loved ones feel special every day – birthdays just exhaust me. I know I sound like a grinch but you were asking, right? Oh I loved reading through all the comments on this post – it helped ease my mom guilt! My daughter turns five in a few weeks, and in her first year of school she was heart broken when I told her we’d be having a family-only party. But even if I didn’t invite her whole class (24 kids), she still has at least 8 “good” school friends and our house is too small for that many kids, let alone any parents who stay (and renting a facility is not how we would choose to spend that amount of money). And then what do I do about the family who have come to her winter (horrid driving conditions some years!) birthday year after year? Throw TWO parties?! Ack! So instead we’re just sticking to our usual invitees… and on her actual day will send a non-food treat to school for her to share with her whole class. My kids are older (19 and 16) and I am thrilled not to have to deal with their birthday parties anymore. Of course, we still celebrate, but usually go out to a nice restaurant, maybe take a friend or two of theirs, etc. When they were younger, we lived in an affluent area and the birthday parties were ridiculous. One memorable one involved a Hummer limo picking the kids up from school (a no-no as it can lead to hurt feelings if not all kids are invited) with the birthday boy being presented with an iPhone in the limo. This was years ago, so iPhones – especially in elementary school – were astonishing new things. On the opposite ends of the spectrum, we always had backyard parties, or ones in a local park or at the pool. Sometimes, we’d take a few kids to a movie. One of the best things we ever did was keep an invention box – cleaned-out yogurt containers, old boxes, cardboard tubes from paper towels and toilet paper, chopsticks, all sorts of random things – and at a 5-year-old’s party, gave each kid a roll of tape and let them make inventions. The rockets ships, cars, and airplanes, and random sculptures that came out of that experience were wonderful. The birthday party wars has only escalated since my kids were younger, thanks to Pinterest. Simple is best. I LOVE the invention idea! How fun! Simple is best. I think Pinterest actually helps on that front though. We just have to work to manage our own expectations. Good point about how Pinterest can be useful. I highly recommend creating and keeping an invention box for preschool and early elementary school aged kids. They are lots of fun. I just don’t do birthday parties. Mostly because I don’t want people giving my kids more stuff. We have a tiny house and I don’t think they need more stuff. Perhaps it’s easier because my kids birthdays all fall in the summer, so they aren’t even in school, and they are still pretty young (2, 4, and 6). As a family we do a fun outing and have cake and let the kids choose a restaurant to eat at (we don’t really eat out except for special occasions). But I enjoy throwing a party and my older two girls like playing with friends. For the last two years we have hosted an “Art Party” the week after school is out, so it’s close to their birthdays and they feel like they got a party. They invite all their friends, but I know that many won’t be able to come, so it’s okay. We have a few art projects to do and then we decorate cupcakes and that’s it. And it has been a hit each time! I feel like it’s a win-win; a fun party for the kids doing something they love and without the pressure of giving or receiving gifts that we don’t want/need. We’d like to keep the tradition. The etiquette of birthday parties stresses me out! I prefer family parties for that reason, but then you also have to worry about your kid’s feelings when they get invited to their friends’ big shindigs. My experience of friend parties as a child was not that great. I had one, when I was 8, and it’s a very stressful memory for me b/c my friends from school and church did not know each other, and I kept worrying I was ignoring one or the other group. I was a pretty sensitive kid and I was very concerned about anyone else feeling left out. I really like the idea of no presents. What do others think about having a party where guests bring donations for a local charity of the birthday child’s choice? Like the local food bank, homeless shelter, hospital? Then the birthday child gets to also deliver the donations. Three of my girls are born the same week in August; my twins birthday was so low key that I had a hard time remembering what we did:) My oldest got a family night at a trampoline center. The twins had a horse event with cousins, gifts and a cake. We did not find friends that were not on vacation in the beginning of August! For that I have to wait for September. I don’t remember if I got the idea here, but it is a relief to skip years for friends parties. There is a fatigue! My April baby is a little luckier for that. From 7 on our kids plan their own parties– we step in and give a budget if it seems necessary but they plan the whole thing. We help by securing logistics- we call the venue if they want it somewhere specific and things like that but from invites, to decorations, to food – they do it. Basically they are the directors and I’m the runner! I will make a cake with or without the other daughter if that is what they want or they make it. I never really thought of doing it once they were 6. My oldest one is 11. They often make the invites and decorations with friends in the weeks leading up to the party- I have a feeling that is the best part for them! Let’s face it, we can’t all keep up the plans we made at younger ages, when we and the children were younger, and we had fewer kids. As our family grows, we grow older and we change, priorities change, energy levels change. I don’t think it’s a bad thing at all, just life! I feel in a similar way about Christmas. How many decorations and parties and cookies and activities do we need to cram into December to make it seem worthwhile? Too much for me! As I got older, I let my kids lead me in what they want for birthdays and parties, and as you described, we were able to talk through what was wanted. My kids have such different personalities, that one may want a lot of friends to celebrate with, and another just wants to do something special with her best friend. In fact, my youngest at 15 became very overwhelmed even with just a family party, so we even dialed that waaaay back and it just became our immediate family, no grandparents, aunts, uncles, cousins. It sounds like Oscar had just the party he needed, sounds like a lot of fun! Success! I think any party will feel a little exhausting afterward, but worthwhile things often feel that way when they’re done. I come from a family of introverts, so I think “big” parties were never any of our idea of fun. lol. The “Big parties” I remember in my own life were when I was 8 (my birthday is a week before halloween, so my folks scheduled my party to happen ON halloween, and they actually took me and about 10 of my friends trick or treating as the primary party game! Genius, really. ), and then they all slept over. The other one was when I was 13, and it was a surprise slumber party for me and my core group of 6 friends. Even then, we’re only talking about a few handfuls of people and yet, those parties felt enormous. Most years, my parents just had me choose 2 or 3 close friends, and we’d have a very reasonable slumber party situation. Maybe go see a movie, come home, enjoy a make-your-own-pizza thing and have a Baskin Robbins Ice cream cake. In the morning, my dad would get donuts. And for my sister and I, those sorts of birthday experiences were still totally magical, even though it seems so simple. Like you we had a plan, and just like you sometimes it works and sometimes it doesn’t. I am having a hard time with big friend parties too. One is because of the expense. A party either at the home or at a facility can cost upwards to $300. The second problem I have is that it seems like everyone is busy. Who wants to plan a big party and then only have two kids show up. Yes, two is nice in terms of cleaning up, but if you have spent $300 on decorations and party bags and people cancel it can be frustrating. The third problem is that I just feel like everything is just over the top these days. Long gone are the few pieces of candy and a couple of valentines. You are now expected to go on Pinterest and make an elaborate card and a whole party bag of treats that barely have time to be eaten before the next holiday roles around the corner. I feel like my kids just don’t appreciate anything as it is just expected. We live in an affluent area and while we to make a good outcome we were shocked that our son just thought it was a given that parents should pay for college. We will of course pay for his schooling, but the fact that he just thought it was a given and a given for all families makes me feel frustrated. This year with two birthdays in December and one in November we opted for birthday play-dates, oldest child turning 10. Each child on their birthday (or close to it) picked one friend to take out to eat and an activity. Two kids picked the movies and one picked a trampoline place. The other siblings stayed home with dad. It was nice to have just the birthday kid and a special friend and then we didn’t have an unnecessary pile of presents but one well thought out gift from a friend. We did cupcakes at home with our family and called it done! Our first child (a boy) has a summer birthday. He was an only child for 5 years, so had great big parties. Every year we would rent the gazebo at the local park/wading pool, invite ALL his daycare/preschool/neighborhood friends, and BBQ. We would have a theme – superheroes, pirates, Star Wars – do a fun themed cake and goodies and the kids would just play outside and the parents would socialize. It was GREAT FUN. But, then one year I had 40 RSVPs and made 40 superhero capes – that was crazy. Since he started Kindergarten, the classes have gotten bigger and bigger, so we have pared down on the number of invites. Last year we decided that if he is turning X, he can invite X number of friends. It’s tough, because I would love to invite all the kids in his classroom, so no one is excluded, but it just becomes too much to handle. Our parties have pared down too – we definitely schedule something active or outside, but now we just do a simple menu and fun cupcakes (he would rather have them than a cake). This year we rented a skate park and had skate-boarding lessons. Loads of fun! Oh, and Oscar’s party was brilliant!!! I am borrowing that idea for the next party. Nothing like something laid back and mellow, with a bit of crafts and wizarding thrown in! This has worked great for us for a long time. I don’t know why I have absolutely never thought of this before… but Oscar has truly blown my mind with his combination cake idea. 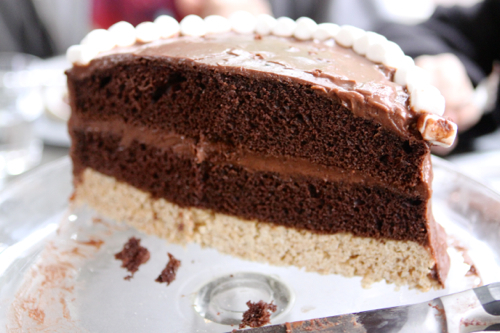 Up until now, I’ve always thought of cake as one type – chocolate, banana, vanilla, red velvet etc. But what he has done to my cake world has truly messed with me! Chocolate + rice krispies + chocolate pudding + marshmallows! Would you please give that kid a prize? My daughter and I are now just dreaming up all sorts of combination cake options to celebrate for the next birthday. I find it hard as my kids all have winter birthdays so a park party is out. We have to hire a space as our apartment is tiny so it starts off being expensive! That said, I usually do the entertainment/food and they seem to appreciate it – although I dread the run up and we have one next week! Mom of six here and I know your dilemma! My oldest child’s first birthday had 70 guests and my youngest child’s first birthday had four guests. I have seen the light so let me help! Lol – I was wearing myself out for no reason spending time and money on loads of food and special decorations. Then I realized It wasn’t necessary- I have good birthday memories and never had elaborate parties- the generation before us certainly never had elaborate parties. So now I concentrate on making the birthday kid feel special- pick a restaurant, a homemade meal, a movie, a visit to the zoo, etc. For the older kids, not spending money on large amounts of food for party guests can mean having extra money to spend on gifts for teenagers. In my experience, giving a nice gift to a child because more expensive as they get older. Cut back and relax! Man, can I relate to this. I think part of the issue is the YEARS you end up doing parties when you have a large family as compared to people with smaller families. Also, I’m more”practical” as I get older and I find my self irritated with excess when simple is just fine. Plus, Im tired. My youngest two have gotten so much less than my older kids did. But God was gracious and gave me boys at the end who don’t really care! Good thing! Hi Gaby, Your short hair looks adorable! I am also feeling burnt out on birthday parties. Happily, there are so many great ways to make meaning of the day for child and family. Several ways to mark the passage of time with service projects. MILK + BOOKIES has a BOOKIES BOX made especially for this. It’s a tool kit for having a book drive with a heavy emphasis on community involvement for the birthday child (and their family). I hope you and your readers will check it out. Oscar’s party sounds great! My son is the same age and also likes “hang out” type parties. He has a fall birthday- last year we invited friends over in the evening for a cookout and s’mores over the firepit. Added glowsticks and a flashlight scavenger hunt in the yard and all were happy. This past year we provided lots of food and a “photo booth” as the only activity- foil fringe curtain on the wall with some helium balloons around it, a bin of photo props gleaned from our dress-up box, and my phone mounted on a tripod. I bought a $5 remote shutter release and a teenage friend sat and snapped pictures. Kept them occupied the whole time and the photos were great mementos!